Fresh to Frozen’s Junior Southard with future owners Jessica Cason and 6-week-old Paisley. Forget Wal-Mart. Where else can you get six pounds of Port Royal brand tomato paste for $3.47? Or a giant box of Utz potato chips — 36 bags — for $5.99? 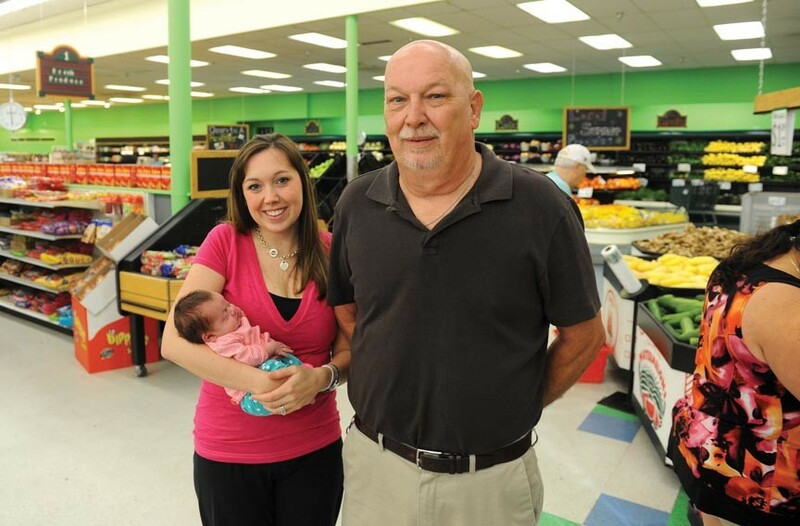 The Fresh to Frozen salvage grocery store at 7803 Midlothian Turnpike may sound like a dangerous place to buy food, but owner Junior Southard won't hear it. He's been in the business 30 years. "I've never had anyone buy from me and get sick," he says. No, it isn't exactly a ringing endorsement. But Southard doesn't need endorsements. His slightly damaged goods, which he buys from food wholesalers, trucking companies and insurance reclamation centers, sell themselves. A pallet of cereal gets dinged up, the boxes slightly smushed, and Food Lion sends it back. It winds up at Fresh to Frozen, still perfectly edible, and reduced dramatically in price. Five ears of corn sell for $2. Half-gallons of Safeway premium ice cream cost $2.09. Eight 40-ounce bottles of beer — in the mix and match crate — run you $20. And it's a family business. Southard, who opened in the former Ukrop's Super Market near Putt-Putt just down the road from the old Cloverleaf Mall site, opened the store in April 2010. He could open more stores, but he doesn't want to. His daughter, who's often in the store with her six-week old, Paisley, in tow, says her father is quick to remind his more ambitious underlings that "one gold mine is better than three silver mines." Southard concurs. "I didn't do this to get filthy rich," he says. "I did this to enjoy my life."